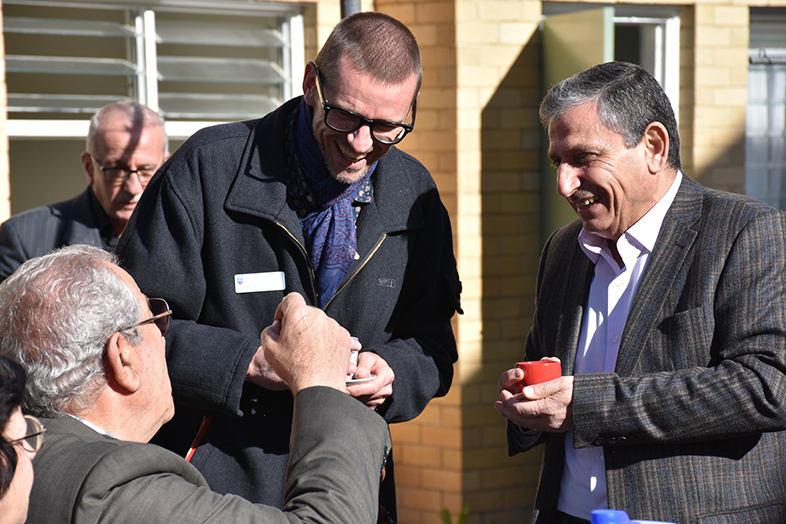 On a perfect Winter day, residents of the Eltham Refugee Housing and Support Project shared lunch with CatholicCare staff and volunteers and to acknowledge two people who were keen advocates for the establishment of the project. It was late in 2015, following the Federal Government announcement that Australia would settle an additional 12,000 refugees fleeing the conflict in Syria. John Willis, Group Manager Inclusive Health at St Vincent’s Health Australia contacted Sheree Limbrick, Deputy CEO of CatholicCare to ask how the two organisations could partner to offer support to the families seeking to make a new home in Victoria. Together, they devised an innovative housing and support solution. St Vincent’s would provide accommodation in the form of disused bedsit units at Eltham Village and CatholicCare would provide Tenancy and Settlement Support. Refurbishments, planning permits and lots of community engagement followed – not to mention generous support from The Order of Malta, Gill Family Foundation and the Swan Family. In December 2016, the first of the new residents moved in. Today, there are over 30 residents living at the units and many of them were enjoying the sunshine at the lunch held in the communal garden. Sheree Limbrick was similarly pleased to see the fruits of the partnership in the flourishing of a new community.